This stunning Saturn-inspired bowl is "spun" rather than shaped through mouthblowing. Saturn's iconic rings are formed from millions of space snowballs interacting with massive gravitational forces. On a much smaller scale, Richard Glass crafts his sculptural Saturn-inspired bowls using colorful metal oxides and centrifugal force rather than glassblowing techniques. For each bowl, he works with three layers of colored glass to create contrasting rings when the molten form is spun and stretched by hand. He adds a fourth layer to seal the colors and make a smooth, clear rim. With its elegant elongated shape and gorgeously translucent colors, each one-of-a-kind bowl makes a unique statement piece for your dining table or sideboard, or an unforgettable wedding or housewarming gift. Handmade in the Devon village of Bovey Tracey, England. We spoke with Richard, and we asked him, "Why glass?" Find out what he had to say on our blog. Richard Glass's glassblowing studio is nestled in the small Devonshire town of Bovey Tracey in England. 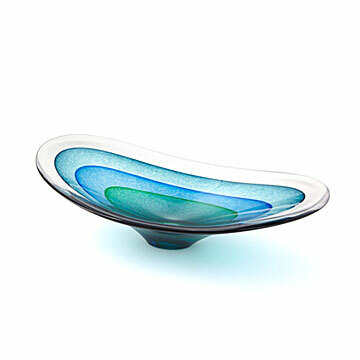 Together with two other designers and glassblowers, he can boast 70 years of experience working with glass. Their design inspirations often come from the beautiful Devon coastline combined with the directness and fluidity of hot glass itself. Their forms are often understated and organic.